Mini E electric car trial ends | What Car? The latest Mini E electric car trial has come to an end in the UK. 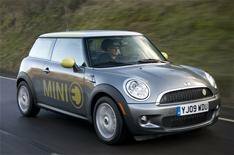 Forty drivers have been putting the electric Mini through its paces on the UK's roads since December 2009. The trial is part of research being carried out by the Technology Strategy Board and the Department for Transports 25m Ultra-Low-Carbon Vehicles Demonstrator Programme. • Mini E usage differs only slightly from a control group of conventional car drivers in terms of average journey distance, daily mileage and frequency of use. • Before the trial, users suffered from anxiety over range and charging times. In practice, users reported these areas to be only minor barriers. • Users felt confident that the Mini E itself and the charging process were completely safe. • Users felt that renewable energy sources should play a key role in the development of new technology such as electric cars. • Users believed that the BMW Group is trusted to provide a realistic and practical solution to the challenge presented by EVs. • The study found that users wanted more space for passengers and luggage. • Most users wanted more public charging facilities, although the majority of them also claimed they coped well without them.